A stylish way to wick sweat and keep your hair in place during your workout. Snug, soft and quick-drying; very breathable, durable and sweat absorption mens headband. Poshei headbands for men is perfect for any type of health and fitness training, simple design serves a variety of purposes. You will get 3 packs sweat headbands,it is the best choice for making you feel comfortable and protecting yourself during your sports. Keeps sweat away from eyes: the headbands for men will stop the sweat from coming into your eyes. but is not limited to gardening, traveling, shopping or even wearing to work or school. Poshei sweat headband is made of 95% polyester, 5% spandex, high performance material of mens headbands sweatbands and wristband. Lightweight and Stretchy: the headbands for men will give a great fit without causing pressure or discomfort while keeping your hair in place. Headbands for men Fits everyone, best suited for head sizes 49 cm to 60 cm. When laid flat the sweat headband measures 23cm x 13cm; Stylish and versatile, sweat headband suitable for men and women. Make you feel cool and comfortable; Poshei mens headband is the best choice for doing excercise and outdoor sports. UV protection,rock your mens headband to wick away sweat and protect yourself from the sun. 100% Customer Satisfaction Guarantee: Please feel free to contact us if there are any problems and we'd be glad to assist. Email us at poshei_amazon@yahoo. 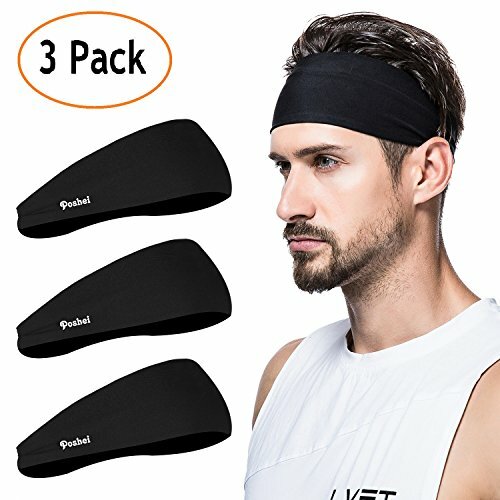 TRANSPORTS MOISTURE AWAY FROM SKIN (3 PACKS): Poshei mens headband is made of 95% polyester, 5% spandex,strechable, breathable,sweat wicking and soft; Keep your eyes away from sweat,wick away moisture and dry quickly. LIGHTWEIGHT & PRACTICAL:feels like wearing nothing.Lightweight sweat headband with perfect one-size-fits-all technology to put very little pressure on your head while staying right where you put it. High stretchable to suited for head circumference about 49 - 60 cm. EASY TO WEAR & MULTIFUNCTIONAL:The headbands for men sewn into the back of the bandana headband allows you to put the mens headband on without the need for tying any knots;Convenience to carry on, you could fold mens headband and put in your pocket or your travel bag or just wear as wristband. VERSATILE & ALL-SEASON ITEM - Boosts yourself confidence and performance; Poshei mens headband is suitable for walking, running, hiking,working out, biking, riding, fishing,yoga,exercise & fitness, gym, crossfit, basketball, football, volleyball, tennis,etc. 100% SATISFACTION & 90 DAYS MONEY BACK GUARANTEE - We offer you 100% Risk Free Satisfaction Guarantee and 1 year warranty to let you buy with confidence In case any problem happens to the headbands for men , please contact us.We will solve the problem until satisfaction. If you have any questions about this product by poshei, contact us by completing and submitting the form below. If you are looking for a specif part number, please include it with your message.